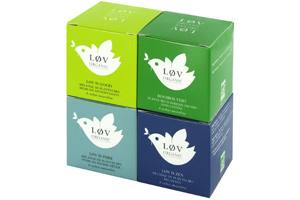 Løv Organic herbal tea gift set "All my Løv"
The perfect gift or a great way to discover the Løv Organic organic herbal tea range : 12 of the most beloved herbal teas of Løv Organic. Classic infusions, flavoured rooibos or wellness herbal teas… There’s something for everyone in All my Løv Infusion ! This organic herbal tea gift set contains 24 enveloped muslin Løv Organic tea bags - 2 of each of the following : Løv is Good, Løv is Zen, Løvely Night, Exotic Fruit Tea, Wild Berry Fruit Tea, Citrus Fruit Tea, Verbena, Liquorice-Mint, Fenel-Anise, Rose Rooibos, Almond Rooibos, Pineapple-Mint Green Rooibos.